Sako Rifles For Sale. Browse Our Wide Range Of Sako Rifles. We have a large selection of new and used Sako rifles for sale, delivering quality products across the UK. From the seasoned professional, to those with a blossoming new interest in the firearms world, Guntrader has got every base covered. Great condition. Threaded at 1/2 inch UNF. Iron sights have been removed. Good condition Sako 75 Hunter Wood Blued bolt action rifle in .223 calibre. Oil finished pistol grip stock fitted with a large Silver's style rubber heel pad, the stock also incorporates a rolled over right handed cheek piece. New 85 S Varmint Laminate Stainless bolt action rifle. sako 85 s grey wolf stainless steel grey laminate. with leupold 3.5x14x50 silver scope and sako optilocke stainless rings. ready to go stalking. This is a brand new Sako Finnfire II with a Synthetic stock and a 16 1/2” .22Lr barrel - a lightweight and accurate rifle that would be perfect for use from a vehicle or on foot to control vermin such as rabbits, squirrels and rats. 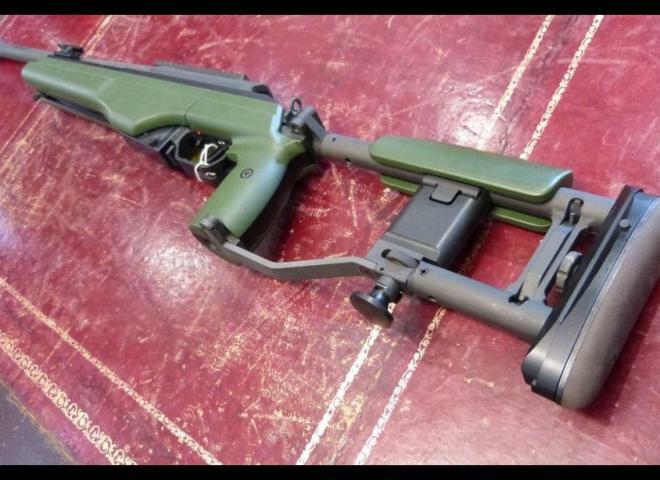 Custom state of the art Sako TR-22 .308 with folding stock and 19inch barrel equipped with muzzle brake. Sako 75 Action IV Hunter Wood Blued, 6.5x55 Se B/A Rifle. 22" un-sighted medium weight barrel, Walnut stock. With Schmidt & Bender 6x42 scope. This rifle is in very good condition. A new Sako 85 in .243. Please enquire about our kit prices which include Stalon moderators and Opti lock mounts. New SAKO 85 Left Handed Carbon Light. Beat the long factory delivery times. This left hand SAKO 85 Carbon Light is available now @ £2750.00 Half the price of a Sauer 404 Carbon!! Supplied with original box and 5 shot magazine. Sako 85 S left handed in immaculate condition, Sako mounts and rings, and DPT ultralight moderator. The scope is not included, If you would like the scope it is £300 extra. Thanks for looking, Steve. .25-06 Sako M995 B/A Rifle, with New 24” stainless barrel, screw cut 14x1mm with invisible thread cap, only proof loads fired, very nice rifle. 6.5 x 47 Lapua, Sako, With New 24” Loather Walther varmint barrel, only proof loads fire, screw cut 5/8”unf with invisible thread cap. Re blued and looking very good, with nice wood. Fantastic condtion Sako varmint quad, comes with 1x5 shot mag, 2x10 shot mags sound mod, scope rings and sling. Fantastic value for money. 01223 837977. New Sako 85 short Action with Varmint 20" fluted barrel and brown laminated stock. With rings and threaded - this is a great rifle that has been beautifully engineered. Like all Sako stuff this is an exceptional bit of kit. Ask us what scope and moderator to put on. A Sako 75 in .222. This gun comes with an ASE Ultra moderator proof tested. Sako III Rifle, .243 Bolt action, with a polymer stock. Supplied with one magazine and a Hornady leather sling. Comes with a brand new Zeiss Conquest scope. 5-25x50.Just been fitted. SAKO .308 RIFLE IS AS GOOD AS NEW !! HAS ONLY SHOT 40 ROUNDS !! Sako 75 synthetic stainless fitted with a German Schmidt and Bender 6x42 . One owner from new .